How to survive Moscow's winter? Everybody knows that winters in Russia are very cold so can you imagine what people from warm countries feel while living in Russia! We asked students from African, Latin American and European countries about what they do not to die in Moscow! In the beginning, each person shared his first impressions about Russia and Moscow. They imagined Russia as a big country, which is true, but it appeared that Russia was not only frosty Siberia, that you don’t meet a bear in the streets everyday and of course you don’t drink vodka from a Samovar! Then they all said that after some time they realized that in fact it wasn’t so bad. Moscow is like Milan and people in the metro are not angry, they are just hard workers and in the reality are very generous and warm! However, the first meeting with winter wasn`t so warm. «The wind hauls around and you can catch a cold!» said Parfait Kezimana - a Burundi student of People`s Friendship University (PFUR). He has been living in Moscow for seven years and now, finally, he took the lid of Russians: «You always need to wear warm clothes no matter what temperature is outside, just be prepared for everything!». The other students are not so scared of Russian winter. For them winter is a time of joy, especially when there is so much snow in the streets. 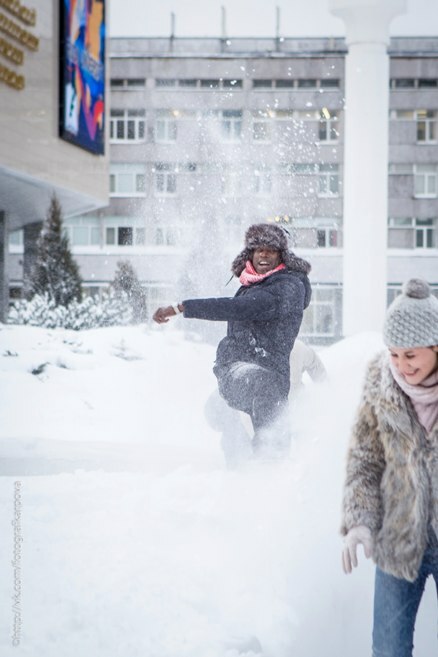 Many of foreigners have fallen in love with traditional Russian amusements as snowball fight or skating. «You need to move not to feel cold!», said many students. Moreover, they mentioned that during winter it’s better to eat fat food and of course the best are pancakes with sour cream and with hot tea! Tea is actually another way to get warm during winter in Russia. «In every café and restaurant in Moscow there is a Wi-Fi so when it`s -20°C I just go to one of this places with a notebook, take a big cup of tea and enjoy the snow outside», PFUR`s student from Italy said. So maybe it`s not so hard to survive this cold weather in Moscow? Maybe it’s even funny and romantic? Federica Lo Curto is an Italian student from Napoli; she came to Russia just for one semester. For her Russia is a beautiful country from a fairy-tale. And she felt this magic from the first sight: here she saw the snow for the first time! «I remember it was in October and it was wonderful!» she said. «So there is nothing bad and frightful in cold weather, the most important are impressions!» she resumed.